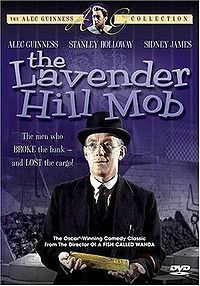 The Lavender Hill Mob is a 1951 comedy film from Ealing Studios, written by T.E.B. Clarke, directed by Charles Crichton and starring Alec Guinness, Stanley Holloway and Sid James as gold bullion thieves. The title refers to Lavender Hill, a street in Battersea, a district of South London, in the postcode area SW11, near to Clapham Junction railway station.